Dale Earnhardt Jr. with the No. 2 Rod Osterlund-owned 1979 Chevrolet with which Dale Earnhardt won 1979 Rookie of the Year and the 1980 championship in the NASCAR Winston Cup Series on Oct. 13, 2017 (photo courtesy of Getty Images for NASCAR). 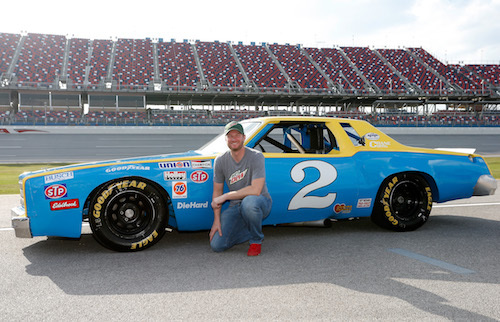 To honor the retiring Dale Earnhardt Jr., Talladega (Ala.) Superspeedway presented Earnhardt Jr. on Oct. 13 with the No. 2 1979 Chevrolet owned by Rod Osterlund that his father, the late Dale Earnhardt drove to 1979 NASCAR Winston (now-Monster Energy NASCAR) Cup Series Rookie of the Year honors and the 1980 championship. Ownership of the car wasn’t transferred to Earnhardt Jr., but he was loaned the car for as long as he wanted to do whatever he wanted with it. The car is owned by the International Motorsports Hall of Fame, operated by the state of Alabama and located on Talladega Superspeedway property. After the presentation, Earnhardt Jr. drove the car for two laps around the 2.66-mile track. NASCAR legend Donnie Allison, then, drove the car during the pace/parade laps prior to Sunday’s green flag of the Alabama 500 Monster Energy NASCAR Cup Series race at Talladega. Earnhardt Jr. also was given a bottle of wine from the same case as the bottle with which he celebrated his first Talladega win in Oct. 2001 and a bottle from the same case as the bottle his father celebrated his last Cup Series win the previous year.